74 • ROCK products • March 2019 www.rockproducts.com P.O. Box 104524 • Jefferson City, MO 65110 (573) 635-8700 • Fax (573) 635-0630 Or Call Us Toll Free!! 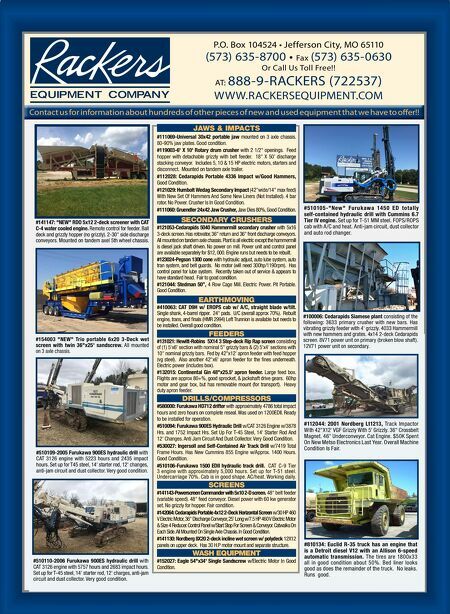 AT: 888-9-RACKERS (722537) WWW.RACKERSEQUIPMENT.COM Contact us for information about hundreds of other pieces of new and used equipment that we have to offer!! #510109-2005 Furukawa 900ES hydraulic drill with CAT 3126 engine with 5223 hours and 2435 impact hours. Set up for T45 steel, 14' starter rod, 12' changes, anti-jam circuit and dust collector. Very good condition. JAWS & IMPACTS #111069-Universal 30x42 portable jaw mounted on 3 axle chassis. 80-90% jaw plates. Good condition. #119003-6' X 10' Rotary drum crusher with 2 1/2" openings. Feed hopper with detachable grizzly with belt feeder. 18" X 50' discharge stacking conveyor. Includes 5, 10 & 15 HP electric motors, starters and disconnect. Mounted on tandem axle trailer. #112028: Cedarapids Portable 4336 Impact w/Good Hammers, Good Condition. #121029: Humbolt Wedag Secondary Impact (42"wide/14" max feed) With New Set Of Hammers And Some New Liners (Not Installed). 4 bar rotor. No Power. Crusher Is In Good Condition. #111060: Gruendler 24x42 Jaw Crusher, Jaw Dies 80%, Good Condition. SECONDARY CRUSHERS #121053-Cedarapids 5040 Hammermill secondary crusher with 5x16 3-deck screen. 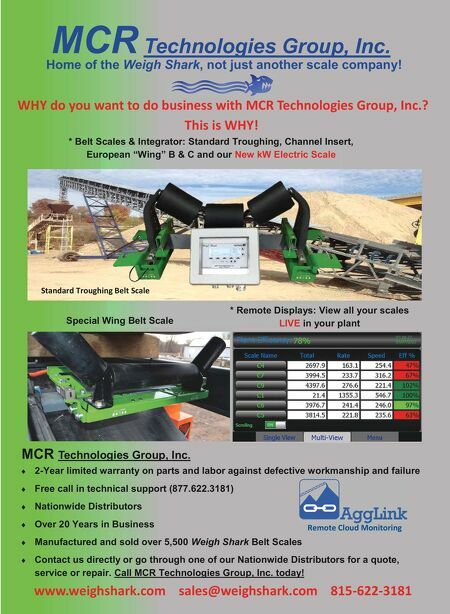 Has rotovator, 36" return and 36" front discharge conveyors. All mounted on tandem axle chassis. Plant is all electric except the hammermill is diesel jack shaft driven. No power on mill. Power unit and control panel are available separately for $12, 000. Engine runs but needs to be rebuilt. #123024-Pegson 1300 cone with hydraulic adjust, auto lube system, auto tran system, and belt guards. No motor (will need 300hp/1190rpm). Has control panel for lube system. Recently taken out of service & appears to have standard head. Fair to good condition. #121044: Stedman 50", 4 Row Cage Mill. Electric Power. Pit Portable. Good Condition. EARTHMOVING #410063: CAT D9H w/ EROPS cab w/ A/C, straight blade w/tilt. Single shank, 4-barrel ripper. 24" pads. U/C (overall approx 70%). Rebuilt engine, trans, and finals (HMR 2994) Left Trunnion is available but needs to be installed. Overall good condition. FEEDERS #131021: Hewitt-Robins 5X14 3 Step-deck Rip Rap screen consisting of (1) 5'x6' section with nominal 5" grizzly bars & (2) 5'x4' sections with 10" nominal grizzly bars. Fed by 42"x12' apron feeder with feed hopper (vg steel). Also another 42"x6' apron feeder for the fines underneath. Electric power (includes box). #132015: Continental Gin 48"x25.5' apron feeder. Large feed box. Flights are approx 80+%, good sprocket, & jackshaft drive gears. 60hp motor and gear box, but has removable mount (for transport). Heavy duty apron feeder. DRILLS/COMPRESSORS #580000: Furukawa HD712 drifter with approximately 4786 total impact hours and zero hours on complete reseal. Was used on 1200EDII. Ready to be installed for operation. #510094: Furukawa 900ES Hydraulic Drill w/CAT 3126 Engine w/3878 Hrs. and 1752 Impact Hrs. Set Up For T-45 Steel, 14' Starter Rod And 12' Changes. Anti Jam Circuit And Dust Collector. Very Good Condition. #530027: Ingersoll and Self-Contained Air Track Drill w/7419 Total Frame Hours. Has New Cummins 855 Engine w/Approx. 1400 Hours. Good Condition. #510106-Furukawa 1500 EDII hydraulic track drill. CAT C-9 Tier 3 engine with approximately 5,000 hours. Set up for T-51 steel. Undercarriage 70%. Cab is in good shape. AC/heat. Working daily. SCREENS #141143-Powerscreen Commander with 5x10 2-D screen. 48" belt feeder (variable speed). 48" feed conveyor. Diesel power with 60 kw generator set. No grizzly for hopper. Fair condition. #142064: Cedarapids Portable 4x12 2-Deck Horizontal Screen w/30 HP 460 V Electric Motor, 36" Discharge Conveyor, 25' Long w/7.5 HP 460 V Electric Motor & Size 4 Reducer. Control Panel w/Start Stop For Screen & Conveyor. Catwalks On Each Side. All Mounted On Single Axle Chassis. In Good Condition. #141130: Nordberg 8X20 2-deck incline wet screen w/ polydeck 12X12 panels on upper deck. Has 30 H.P motor mount and separate structure. WASH EQUIPMENT #152027: Eagle 54"x34' Single Sandscrew w/Electric Motor In Good Condition. #100006: Cedarapids Siamese plant consisting of the following: 3633 primary crusher with new bars. Has vibrating grizzly feeder with 4' grizzly. 4033 Hammermill with new hammers and grates. 4x14 2-deck Cedarapids screen. 8V71 power unit on primary (broken blow shaft). 12V71 power unit on secondary. #141147: "NEW" RDO 5x12 2-deck screener with CAT C-4 water cooled engine. Remote control for feeder. Ball deck and grizzly hopper (no grizzly). 2-30" side discharge conveyors. Mounted on tandem axel 5th wheel chassis. #112044: 2001 Nordberg Lt1213, Track Impactor With 42"X12' VGF Grizzly With 5' Grizzly. 36" Crossbelt Magnet. 46" Underconveyor. Cat Engine. $50K Spent On New Metso Electronics Last Year. Overall Machine Condition Is Fair. #154003 "NEW" Trio portable 6x20 3-Deck wet screen with twin 36"x25' sandscrew. All mounted on 3 axle chassis. # 510 10 5 -"N ew " Fur ukawa 14 5 0 ED t o t all y self-contained hydraulic drill with Cummins 6.7 Tier IV engine. Set up for T-51 MM steel. FOPS/ROPS cab with A/C and heat. Anti-jam circuit, dust collector and auto rod changer. #510110-2006 Furukawa 900ES hydraulic drill with CAT 3126 engine with 5757 hours and 2683 impact hours. Set up for T-45 steel, 14' starter rod, 12' charges, anti-jam circuit and dust collector. Very good condition. #810134: Euclid R-35 truck has an engine that is a Detroit diesel V12 with an Allison 6-speed automatic transmission. The tires are 1800x33 all in good condition about 50%. Bed liner looks good as does the remainder of the truck. No leaks. Runs good.